One year coding with "Das Keyboard"
My main motivation to buy the thing was not the missing labels (although that certainly does make it a cool gadget). I am typing 8h at work and do spend quite a bit of time in front of my laptop after work as well. 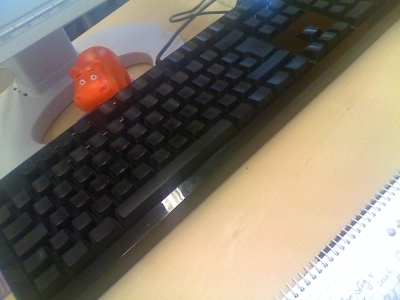 So I wanted a keyboard that is fun to use: This includes typing speed and the tactile feedback of each key.